Reports, quotes, stats specifically about the F1 2007 season Grands Prix. Hmm, I am not too sure about that, we've all seen Kimi do this sort of thing before - I mean, being penalized then driving through the field for a podium, or a win as we saw in 2005 .. I think the stewards were ridiculous with some of their penalties. Kubica drive through penalty for absolutely nothing, I felt it was a blatant favoritism towards Hamilton (where was it that Turn 1 turned into a parking lot earlier this year and the stewards lifted Hamilton from a gravel trap back on track? Ridiculous). I'd like to figure out what caused Alonso's crash. He's not the type of driver to make that mistake just going in. TV coverage was horrible. Last lap battle between Kimi and Heikki wasn't even shown correctly, at least they got the Kubica-Massa duel in the end. Alonso crash had a horrible angle and was just kind of putted over by the commentators (at least here in America). SpeedTV coverage is horrible, this is my first time here at these forums so I'm trying to find the light! Tv coverage was not very good missed all the crashes it was'nt speed tv i was watchin on itv and it was the same it was the japanese director thats why we saw so much of sato. ^^^ must say though you are wrong about hamilton being put back on the track in the european GP in is in the rules that if your engine is still running you WILL be put back on track, schumacker had it happen to him and he was put back on track and got into the points but maybe you have forgoten that. I reckon alonso may have touched the rumble strips swinging his car from under him but he says he was aqua plaining but the coverage misses out the start of that crash? Kimmi did great considering but thats what i expect from him, ferrari ruined massa's race making him pit so many times i think he actually pitted 4 times? why did he also have to pit after only doing 5 laps on new tyres?i would be having words with todt after race if i were him. 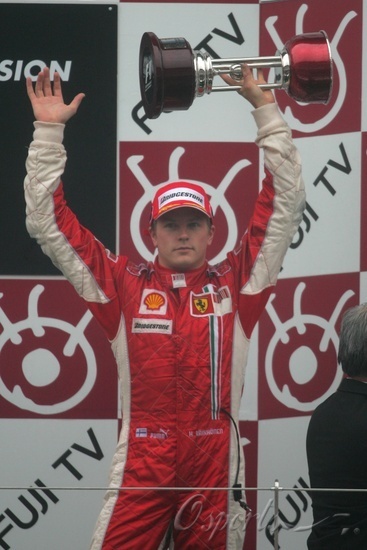 Anyway, no matter how...KiMi, u r the hero i always support!!!! dazmoffman wrote: ^^^ must say though you are wrong about hamilton being put back on the track in the european GP in is in the rules that if your engine is still running you WILL be put back on track, schumacker had it happen to him and he was put back on track and got into the points but maybe you have forgoten that. a stupid race that should never have been started! ferrari compromised by conveniently being the last ones told about the tyre rule! ferrari would have 1-2 if the first pit stop never needed to happen! hamilton was VERY lucky, all he did was drive, no one to bother him and then kubica didnt take him out... LUCKY! well done to kovalainen and kimi who raced brilliantly and fairly... kimi in particular, great fight back! 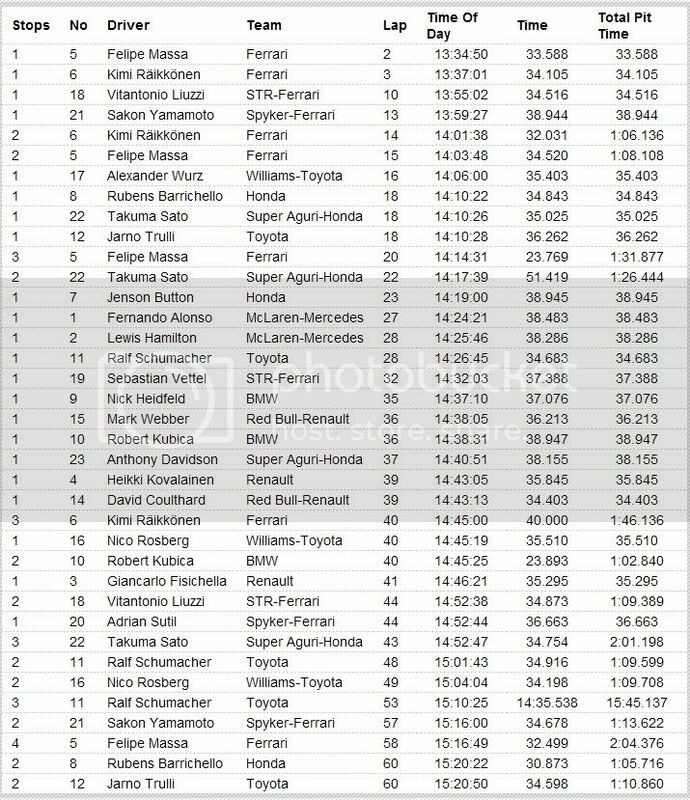 unlucky alonso... silly mistake, so was webber and vetel, silly mistake... i read that it was possibly cause by hamilton who is under investigation... doub anything will come of it though. just a stupid stupid race! Thankyou Schumi you will always have a place in our hearts! Michael Schumacher- 7 volte Campione del mondo! Schumacher senior also enjoyed the same assistance four years ago. The FIA commented on the Hamilton situation too (I quote Richard Woods from the FIA in an interview with the Times) "We are extremely happy with what happened," spokesman Richards Woods told The Times. "He was in a dangerous spot - he kept his engine running and the quickest and easiest way, under the circumstances, to get him and the car out of the way was to get him back on the track and get him going again and, as far as we are concerned, that was fine." constitute a danger or prevent the normal running of the race. she will not be excluded from the race..."
Another issue here was the role the marshalls played. I have it on good authority that Lewis was at one point being told by the marshalls at Turn 1 to get out of his car and get himself to safety. Remember, he was the second guy in there after Jenson. After Lewis came Adrian Sutil, Nico, Scott Speed, Anthony Davidson(who managed to stop on the edge of the corner) and, most dangerously of all, Tonio who came flying in late to join the party. Michael Schumacher(the last man to get the marshalls to help him back onto the track after he had collided with Juan Pablo at the Dunlop Curve at the European Grand Prix at the Nurburgring in 2003). Michael finished fifth in that race after being pushed back on by three marshalls and a tractor driver who had come to drag his car away to retirement. On that occasion, as on this one, the key was that Michael was in a dangerous position and had kept his engine running. Errr...that's it like you said no point in arguing..its in the rules. TS reports that some pundits are implying that Hamilton seems to be under some kind of protection. Kubica was bumping into many guys but got punished only for the Hamilton incident. Then, at the restart Renault was ordered to keep a wider gap to Hamilton so that basically Heikki would have no chance to try to overtake him. Well i don't know what race were you watching but i actually though Ferrari were expecting for Massa to last the distance if the race was shortened (time ending, not laps)... but i guess they pulled him in a bit soone. And also, haven't you read what Massa said this week before the race? If Kimi needs his help he'll play a team game until the end of the season. WDC wrote: ferrari would have 1-2 if the first pit stop never needed to happen! dazmoffman wrote: ^^^ must say though you are wrong about hamilton being put back on the track in the european GP in is in the rules that if your engine is still running you WILL be put back on track, schumacker had it happen to him and he was put back on track and got into the points but maybe you have forgotten that. Okay so lets review, Schumacher has his rear wheels in the sand in a curve which is quite fast, so how do you move the car? you get a crane to move it away... probably bringing out the SC. As the car was still running they pushed him back, but the difference between Hamilton and Schumacher was that Schumacher was helped by the marshals by their own initiative, and Hamiltons move to the track was ordered by Charlie Whiting. I think that in the end it all came back to Hamilton and he didn't score any points, but it did set a nasty precedent in F1. I also think that the race itself should have been restarted with all drivers getting back to their cars, not just the golden boy of FIA. Hamilton under the FIA flag on the podium instead of the UK flag. So if the lead driver was to spinout in the middle of the track, 20 meters from the line on the last lap, a crane could come and pick him up and get him out of danger and across the line? I just read that there was foul play behind Alonsos performance - Pit strategy and Tire pressures .. albeit Macca de-nigh anything of the sort ..
also, FIA have conveniently "apologized" to Ferrari about the tyre mixup and changed the regs again ..
Oh, and - please someone let me know: isnt there a rule in place about erratic driving behind the safety car or bunching the field up to much or something like that? I am sure james allen has a different rule book when he is commentating ..